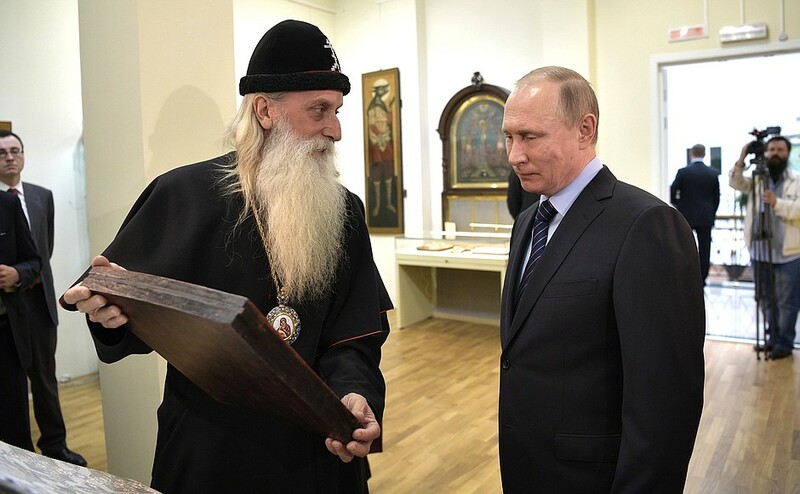 Russian President Vladimir Putin today visited the Rogozhsky spiritual center of the Old Believers in Moscow, the first head of state to visit the cloister in 350 years. The Old Believers, or Old Ritualists, split from the Orthodox Church in 1666 over a change to Christian rituals that had been performed for centuries. The changes were made by Patriarch Nikon of Moscow between 1652 and 1666. They were exiled and discriminated against by the tsars and many fled overseas to locations like Alaska and South America, where some can still be found today. However, the Russian government, under a program to bring them back, has been offering them free land in Siberia to return and many have. In the video (in Russian) Putin can be seen being escorted by Metropolitan Cornelius. The Russian president gave a biography of St. Nicholas and received an icon of the Holy Trinity in return, which he kissed, reported Starov.ru. Putin also visited a site dedicated to Old Believer culture and the Pokrovsky Cathedral of the Russian Orthodox Old Believer Church (RPSC), built in 1792. He also listened to the Old Believer choir.